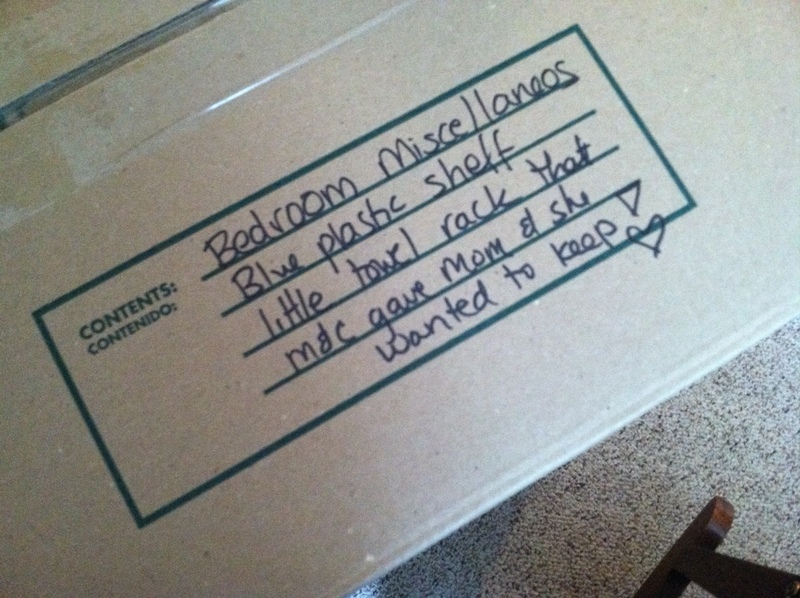 My parents are moving. At 84 and 86 they are once again packing up their bags, lives, and their hearts and heading for a new place, a new space. They have done this many times before – the routine is not new. But that struggle of change versus permanence is written all over this move. They are leaving a community they love, they are leaving an area that has become home. Watching this move is part comedy, part tragedy. My mom comes up to me whispering “Your father wants to keep that!” Her eyes roll and I giggle. My dad hears the giggle and comes in and we try to hide “that”. Or my dad looks at the casserole dishes and pans on the kitchen counter and says in a barely audible voice “Boy, we have a lot of kitchen stuff! Do you think we need all that?” He shakes his head and goes off to rescue an efficiency light bulb from my mom’s give away pile. I take a banana out of an old tin dish that has a floral pattern with a bird in the center. It’s a pretty dish but I need to ask “Do you want to keep this”. She pauses “You know! That belonged to Ralph’s mother – Ralph – what do you think?” Big Mistake. “Oh if it belonged to my mother we keep it.” “Ralph, we’re the kind that would be on the Antique Road Show and they would interview us and we would have to say ‘Yes, we brought this old thing but we found out it’s worth…..Nothing! '” She shakes her head in disgust. I love these two people. So. Dearly. When I asked my mom how many times she had moved she said “Oh I don’t know! I would have to sit down and count!” They have ‘set their hearts on pilgrimage and they go from strength to strength’; whether it be a small town in Massachusetts or a small city in Pakistan, the strength is the same. And I don’t have to ask the secret of their strength. It’s in the index cards taped on the refrigerator or sitting by the bedside. It’s in the prayers that are prayed each morning and evening. It’s in the decisions they make from big to small. Their secret will never make it to Oprah – it’s far too big and good. Their secret is in the Psalms and Proverbs, Genesis and Revelation, in the Alpha and Omega. 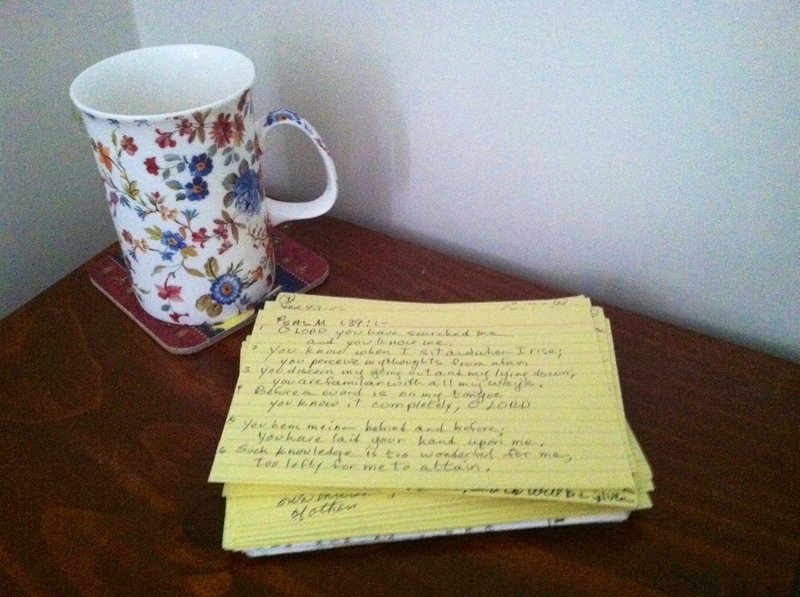 The verse is written in my mom’s familiar handwriting and sits at the top of a stack of cards an inch high. 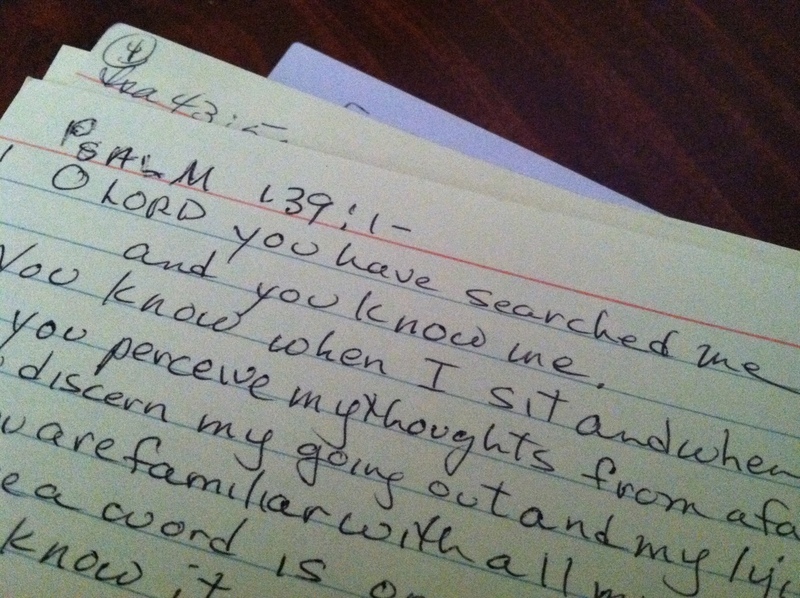 Each one is filled with verses, written evidence of her strength. Though they are surrounded by boxes and tensions come and go, their foundation is rock-solid and depends not on the contents of the boxes, nor where those boxes ultimately land. Their dwelling place is secure, secure and strong as the words written on cards placed at the bedside. What a beautiful testament to your parents. I was so very fortunate to sit under your mom’s bible teaching for a while when my children were very young…..goodness, I guess that means almost twenty years ago? Her voice is so clear in my head as I read your post, as is your dad’s. What a treasure they are!! Praying for them through the move. My folks are 86 and 88 and have chosen to stay put in their own home. I wish I had a house with wings! Jocelyn – thank you so much for this comment. These words are so wonderful. Hope my mom reads them. Was that in Fitchburg per chance? Thanks, Marilyn. Lately when someone moves and says ‘can you use this, we don’t want to throw it away’, or ‘we can’t decide what to do with it’, we always take it. It is far easier for us to make a decision than the person moving. I was pleased to inherit some books just a few months ago from your Dad … and we inherited a whole house and two servants from them in the 80’s! And several jobs, if I remember rightly. Not so sure if I was pleased about all that inheritance! So, a question – in Heaven do we have one home or does the whole world feel like home? Love this comment Rod! And all the things you inherited from mom and dad – WOW!! I well remember my parents joy in getting to know and work with you and Donna. So -as far as your question – I love the though that the whole world would feel like home. What’s your take? I know what it takes to move time and again because I’ve done it more than a couple of times… but to do it again when your in your 80s… Wow! Strength and courage and faith… I suppose it’s a little bit of all of those and laced with a fair sprinkling of fortitude. Shall pray that all goes well and that their move, their transition is smooth. God bless them! Oh yes – beautiful words there Averil….a fair sprinkling of fortitude! Thank you so much for wishing them well. I hope I have half the fortitude that they display! Actually, I don’t – instead I want to thank you for both being there and recording the event so sensitively and lovingly for the rest of us. haha! Actually there’s a story to that! I was trying to convince her she didn’t need it, but mom wanted to keep!! Thank you for the thanks…I don’t deserve it as I have been but a small part. And these things end up working out where one of us ends up in a better place to help at different times. It’s the family piece that works! What an exquisite post, written so lovingly about your treasured parents! And what a wonderful way to begin this week, with their faithful example offered to all your readers. Your parents have clearly lived their lives with Grace and Truth, and they continue to teach by their gentle example. Thank you Cathy – I love this comment! They have. My mom thinks I’ve written too much about her in CAB but I’ve actually not written nearly enough! So many stories! So beautiful! Makes me wish I could meet your parents! :) Best wishes for the move! Jessica – what a lovely comment. Wish you could as well and thank you. Beautifully written, Marilyn. This resonates with a lot of us. Recently I’ve been posting on my FB photos of “houses that we’ve lived in.” Each place has a history and multiple stories. Each has been a temporary dwelling. All point to the fact that we are indeed pilgrims on a journey and ultimately where “In my Father’s house are many rooms; if it were not so I would have told you. I am going to there to prepare a place for you….” (John 14:2…) and there will be our eternal dwelling place with no more sorting, decisions, and moving. As you said, “A Dwelling Place Secure.” Until then let’s just go on singing joyfully, and praising God for the wonderful road that leads us HOME. I love the pictures you’ve been posting – partially because I know some of those houses well….also because it is such a picture of the flexibility, grace, and strength that has accompanied you on your life journey. Thank you. Awwww….I love Aunt Polly and Uncle Ralph! And they love you! Did I hear a rumor that you’ll be in the area? What a wonderful post. I just moved my parents in with me and it was excrutiating to see them muddle through their belongings, some that have been with them for over 60 years. What a blessing that your parents have these truths hidden in their heart and they know where their true treasures are. Such a blessing. Thank you for sharing this. Judy – thanks so much for reading and sharing your parents story. The words “muddle through” are perfect. This whole aging, downsizing, moving, releasing control takes so much courage and grace! Grateful for this comment and I hope it goes well with your parents. What a beautiful blog post and tribute to your wonderful parents! Thank you Janet – it’s quite amazing watching!